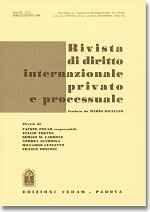 The third issue of 2014 of the Rivista di diritto internazionale privato e processuale (RDIPP, published by CEDAM) was just released. It features one article, the transcript of a public interview celebrating the 120th Anniversary of The Hague Conference on Private International Law, and three comments. Cristina Campiglio, Professor at the University of Pavia, examines the issue of assisted procreation and recent jurisprudence in “Norme italiane sulla procreazione assistita e parametri internazionali: il ruolo creativo della giurisprudenza” (Italian Provisions on Assisted Procreation and International Parameters: The Creative Role of the Courts). Law No 40/2004 on medically assisted conception was adopted to fill-in a major gap in the Italian legal system, putting an end to the so-called “procreative wild west”. However, its provisions had left the majority’s expectations largely unfulfilled. The decade following the entry into force of the law was marked by a number of – national and international – judicial decisions which produced a progressive attrition of the law’s prohibitions. The interaction between the Italian Constitutional Court and the European Court of Human Rights has thus made it possible for judges to consent – in part and as a matter of urgency – to requests of couples who, being carrier of a genetic disease, are willing to have children while avoiding to incur into the risk of transmitting the disorder. Pivotal was certainly decision No 151/2009 whence the Constitutional Court relativized the protection of the embryo. For their part, in 2012 the European Court judges emphasized the disproportion in the Italian legislation of the protection of the embryo, as compared to the other interests at stake. This creative case-law, by assimilating supranational principles, sacrifices the certainty of the law in the name of equitable justice, overcoming the inaction of the Italian Parliament. Fausto Pocar, Professor Emeritus at the University of Milan and Editor in Chief of the Rivista and Hans van Loon, Secretary General of the Hague Conference, in the transcript of a public interview walk us through the many and significant achievements of The Hague Conference on Private International Law in “The 120th Anniversary of The Hague Conference on Private International Law” (in French and English). On the occasion of a workshop convened for the celebration of the 120th Anniversary of the Hague Conference on Private International Law, the Editor in Chief of the Rivista Fausto Pocar and the Secretary General of the Hague Conference Hans van Loon held a public interview on the achievements of the Conference – from its foundation, to the establishment of the Permanent Secretariat in 1955, to modern days – as well as its future goals. The detailed report of the interactive and captivating dialogue that ensued to this encounter spans from the efforts and challenges of transforming the Conference into a global organization, to the Conference’s achievements in the unification of conflict of law rules and in the effective enhancement of inter-State cooperation in civil procedure matters as well as in judicial and administrative assistance. Providing valuable examples of the Conference’s tangible impact on the States’ effort to establish and achieve common goals in private international law matters, this interview provides a precious and rare insight on the Conference’s activity and mechanisms shared by two of the most significant contributors to the Conference’s activity in modern times. Eva De Götzen, PhD at the University of Milan, addresses cross-border employment contracts and relevant connecting factors in light of the ECJ’s recent case-law in “Contratto di lavoro, criteri di collegamento e legge applicabile: luci e ombre del regolamento (CE) n. 593/2008” (Employment Contract, Connecting Factors and Applicable Law: Lights and Shadows of Regulation (EC) No 593/2008). The article faces several issues concerning the choice-of-law rules, provided for by the Rome Convention and the Rome I Regulation, in employment matters. In the first place, an overview of the special connecting factors devoted to employment contracts set forth by the abovementioned uniform instruments is given and their current interpretation (see the Koelzsch, Voogsgeerd and Schlecker cases) is analyzed. In this respect, the article focuses on the relationship between the connecting factors of the locus laboris and the engaging place of business as well as on the interpretational difficulties arising from the application of the so-called escape clause. Moreover, the issue concerning the role played by some Recitals of the Rome I Regulation and by collective agreements in determining the law applicable to relationships between private parties in addition to the rules at hand will be addressed as well. The final question the article refers to is to assess whether the application of the conflict-of-laws rules in employment matters restricts the fundamental freedoms provided for by the EU Treaties or whether it strikes a balance between the free movement of workers and services in the EU internal market and the protection of the weaker party. Giovanni Zarra, PhD candidate at the University of Naples “Federico II”, analyses anti-suit injunctions in jurisdictional conflicts within the European boarders and in the international context in “Il ricorso alle anti-suit injunction per risolvere i conflitti internazionali di giurisdizione e il ruolo dell’international comity” (Recourse to Anti-Suit Injunctions to Solve Conflicts on Jurisdiction and the Role of International Comity). This article analyses the anti-suit injunction, an equitable tool used by common law courts in order to restrain a party from commencing or continuing a national judgement or an arbitral proceeding abroad, the issuance of which is seen by many foreign courts as an offence and an attempt to their sovereignty. After having described the development and the main features of the anti-suit injunction, this article focuses on the possibility and the opportunity for English courts to issue anti-suit injunctions in jurisdictional conflicts within the European boarders and in the international context. With particular regard to intra-EU conflicts of jurisdiction, this article mainly focuses on the effects of the new Regulation (EU) No 1215/2012, whose Recital 12, according to certain scholars, might be interpreted as recognising again the power of English courts to issue anti-suit injunctions after the Court of Justice of the European Union forbade the use of such orders under Regulation (EC) No 44/2001. This article argues that, in a context of global economy, anti-suit injunctions should be used only in exceptional circumstances, in particular when their issuance is in accordance with the principle of international comity, which is proposed as the criterion that should usually guide common law judges when considering issuing an anti-suit injunction. In light of the above, the article eventually tries to make a practical assessment of the situations in which the use of anti-suit injunctions is permitted by the principle of international comity. Cristina Grieco, PhD Candidate at the University of Macerata, addresses the new Italian legislation on e-proceedings in “Il processo telematico italiano e il regolamento (CE) n. 1393/2007 sulle notifiche transfrontaliere” (Italian E-Proceedings and Regulation (EC) No 1393/2007 on the Service in the Member States of Documents in Civil and Commercial Matters). This paper analyzes the new Italian legislation on e-proceedings and the admissibility of the use of electronic instruments for the transmission of judicial documents in compliance with European requirements. The enquiry starts from the scope of application of Regulation No 1393/2007, as outlined by the ECJ in its Alder judgment. First, this paper provides an overview of the rules laid down by the Italian Code of Civil Procedure concerning cross-border notifications, in order to analyze the impact of the legislation on e-proceedings on existing domestic legislation. Then, this study attempts a brief overview of the level of computerization of justice achieved by the Member States and of the initiatives undertaken by the European institutions in this respect. Lastly, the present work explores the possibility of encompassing the tools of electronic communication within the scope of application of Regulation No 1393/2007, with regard to a literal and a systematic interpretation of the relevant provisions. The enquiry focuses particularly on the possibility, at present, to use the tools available for the computerized transmission of judicial documents within the European judicial area and on whether any obstacles to such use are attributable to legal grounds rather than to purely technical considerations.